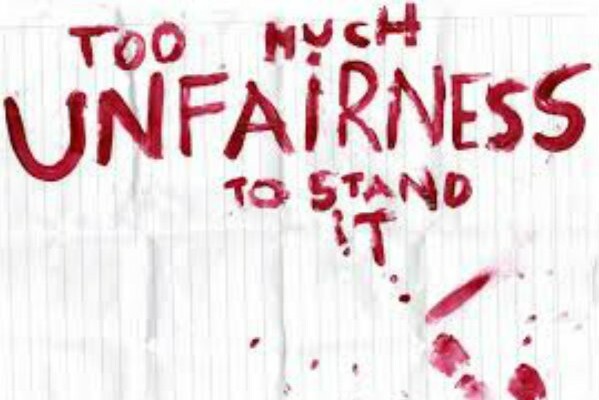 Unfair! Unfair! How often have we felt that “life” was not fair? We’ve all experienced the burn of unfair treatment at one time or another, some life changing injustices and some real or perceived favoritism. So what did we do? Center for Folk and Community Art (“CFCA”) artists, Dena Stewart and Stewart Stewart, went to high schools in inner city neighborhoods and asked teenagers to write a personal narrative about being in an unfair situation, and how they handled it. Then Dena and Stewart showed them how to visualize what they wrote and taught them how to illustrate their stories. Most of the teenagers described typical unfair situations. Some weren’t picked for a team or club they worked hard to qualify for, but in their view someone less talented was selected, and that was unfair. Some believed their siblings received preferential treatment by their parents, and that was unfair. One young lady lost her mother at a young age, and that was unfair. Some had physical disabilities or chronic health problems that interfered with them participating in athletic or social activities, and that was unfair. These teenagers had NO prior art education, so while they were learning to illustrate, they experienced the creative process and learned new methods to confront and overcome frustrations. By sharing their stories, they developed empathy, sympathy and integrity. We THANK our Sponsors for helping us make this Project happen.